This Place of Worship was founded in the 15th century, and we understand it is still open. 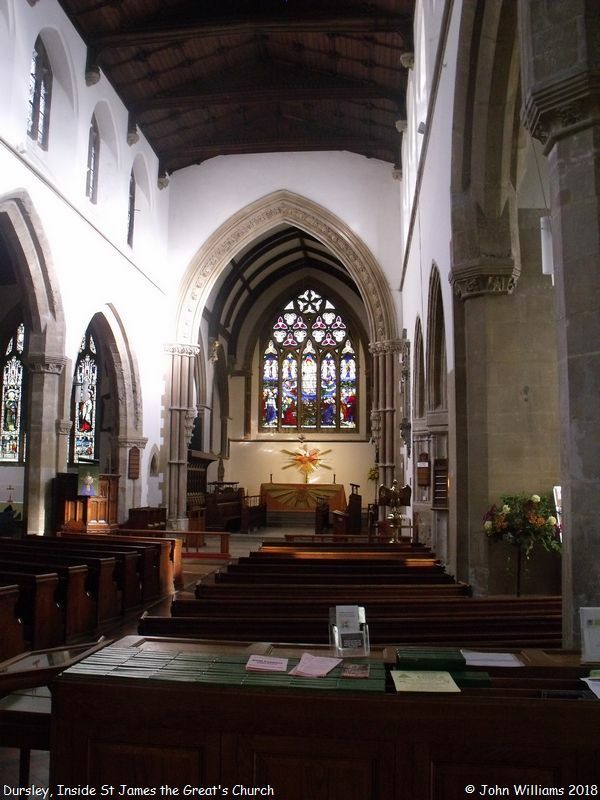 St James the Great's Church is described by the British Listed Buildings website as a late medieval church, dating from the late 15th century, which was built as a replacement for an earlier church of 13-14th century. 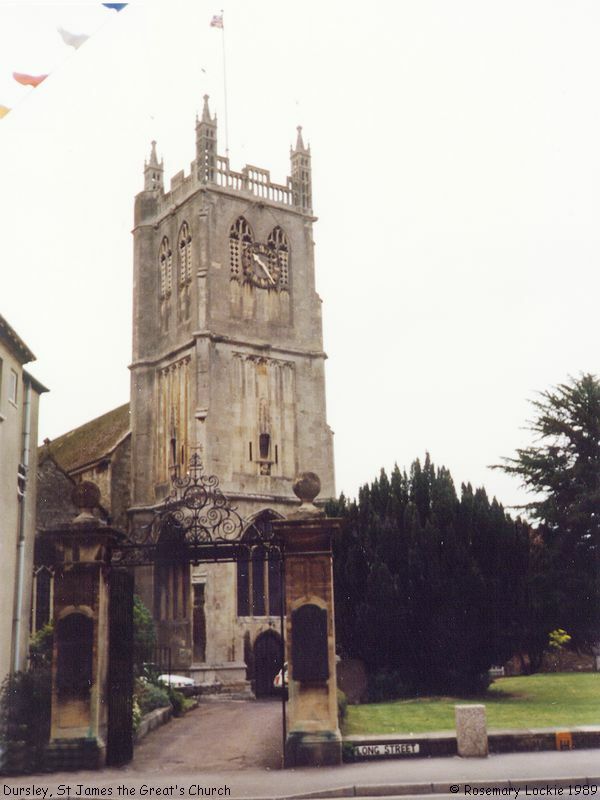 The tower dates from the 18th century (1707-9), by Thomas Sumsion of Colerne, and is a replacement for the medieval tower with spire, which collapsed on 7th January 1698/9. The costs of rebuilding the tower were met largely by a grant from Queen Anne ("Queen Anne's Bounty"). The church is Grade I Listed. Of the early church, very little is said to remain. According to "Dursley and its neighbourhood; being historical memorials of Dursley, Beverston, Cam, and Uley" (J.H. 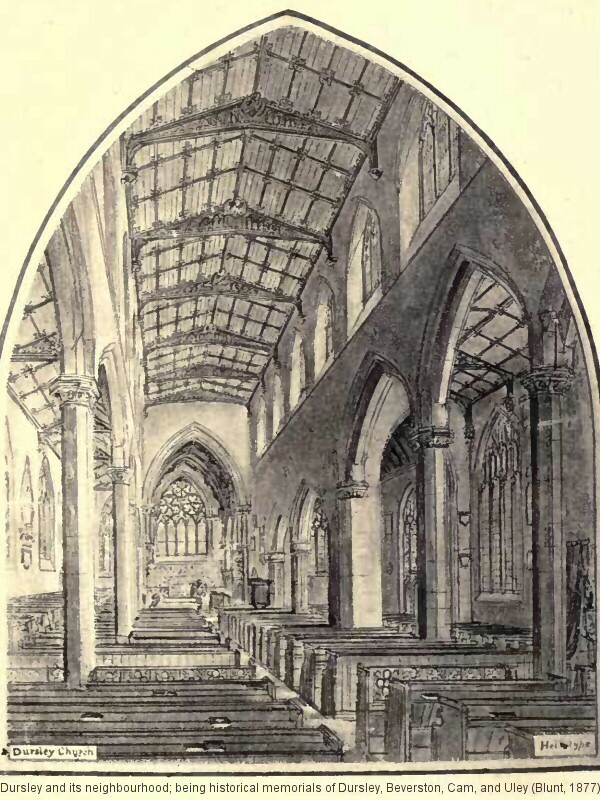 Blunt, 1877), it is said to have consisted of a nave, with a lower roof than at present, a small chancel, and the tower and spire mentioned above. Blunt expressed some doubt whether the present north and south aisles were additions, or replacements for smaller aisles. Both were built (or rebuilt) with chantry chapels at their eastern ends. 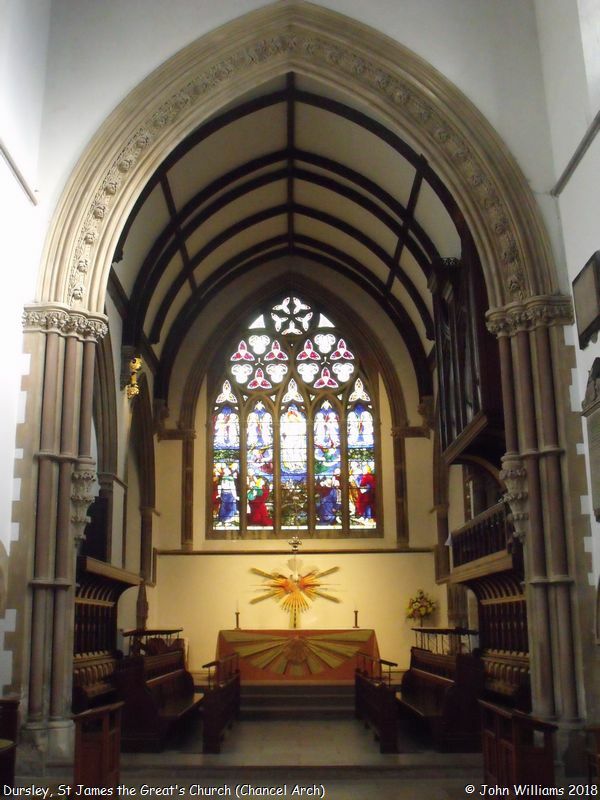 The north aisle was called St Mary's Aisle, and its chapel was dedicated to the Blessed Virgin; that in the south aisle was dedicated to the Holy Trinity. The two illustrations opposite are from this volume (p.64, and p.72). The foundation of St Mary's Chantry is unknown, but that of the Holy Trinity is traditionally said to have been founded by Thomas Tanner, a merchant living in the middle of the 15th century. It is also recorded as such in the Churchwarden's accounts of the following century. 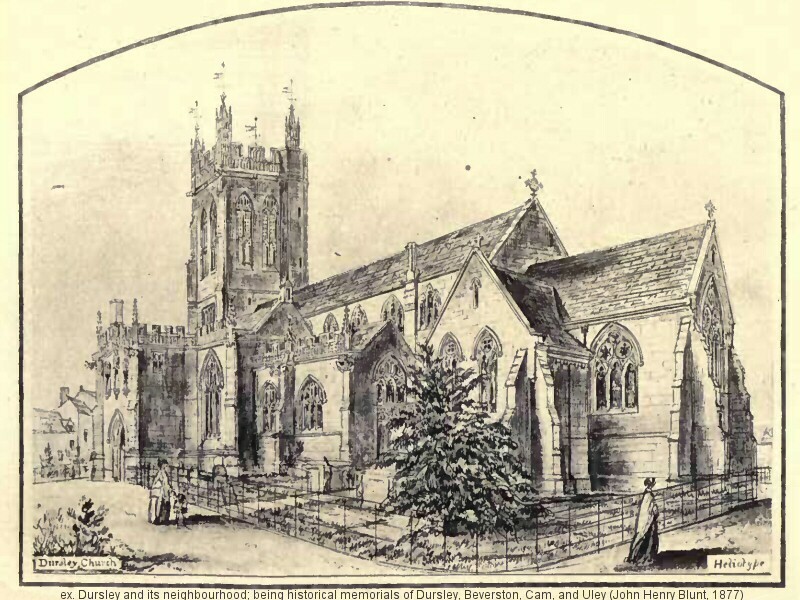 An article in the Transactions of the Bristol & Gloucestershire Archaeological Society - Notes on Tanner's Chapel in Dursley Church (1886-7) - casts doubt on this tradition, as Tanner was said to have died during the reign of Henry VI (1400-1413), and architectural evidence dates the present building from the start of the Tudor period, some 80 years later. In the following century, the official record of seizure of chantry properties (1547-8) records it as 'Trynyte Service', founded by 'dyuerse psons nott Knowen', so evidently this tells a different story to the Churchwarden's accounts! "In the various alterations of the church which occurred in medieval times, these corbels, which probably supported the roof of the chancel, were cast aside, perhaps when the second-pointed chancel was built, and the founders of the Chapel of the Holy Trinity utilised them in that structure". The BGAS article also mentions a 'cadaverous effigy' inside the chapel, traditionally assigned to be of Thomas Tanner, which it likens to one at Westbury on Trym, of John Carpenter, Bishop of Worcester, who died in 1443. It is now headless, and "probably removed from some other part of the church". However in the apparent wish to deny Thomas Tanner any involvement with the chapel, there is no mention that this effigy too could have been transferred from the earlier church. The incumbent of "Trynyte Service" at the time the property of the chantries was seized, was Sir John Coderyngton. He was then aged 80, and was dependent for his living on income from the service, then valued at £6-13s-4d. And "that parcel of the possessions appertaining to the abovesaid Service of the Trynity, being of yearly value of 40s. is claimed by one William Austen, alias Kerner, who brought before us a deed indented of bargain and sale, dated ... (1514) ... wherein it appeared that one William Austen, alias Kerner, father of the said William, bought the premises of one Morice Gilmyn, gent ... for the sum of £60..."
The incumbent of the Chantry of Our Lady was Richard Berye, then aged 58, "having a yearly stipend of 58s., also in the free Chapel of Tokyngton, in the parish of Olveston, of which Sir William Berkeley, Knt, was patron. The stipend here was £6-13s-4d." The above information was compiled with the assistance of the book Dursley and its neighbourhood, by J.H. (John Henry) Blunt (1877), available from The eBook and Texts Archive, and Notes on Tanner's Chapel in Dursley Church by J. Maclean, Vol.11 (1886-87), pp.221-242 of Transactions of The Bristol & Gloucestershire Archaeological Society. To return to more recent times, St James's burial ground was closed in the late 1850s, and burials then took place in the graveyard of St Mark's, in Woodmancote; however I understand St Mark's is also now closed, thanks to information available on the Dursley Town Council website. 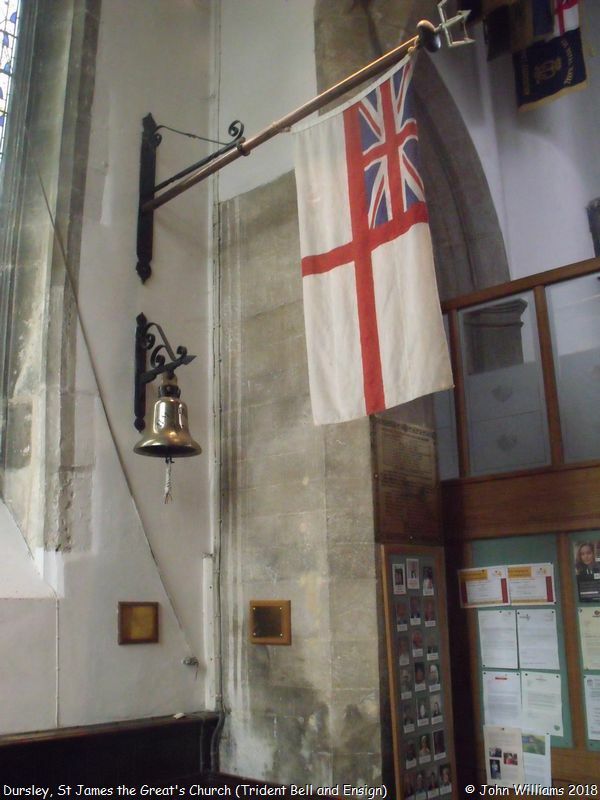 and ratings of H.M.S. Trident in 1945. Commander Captain G.M. Sladen D.S.O. on the 20th of July 1986. St James the Great's Church, Dursley shown on a Google Map. I have found many websites of use whilst compiling the information for this database. Here are some which deserve mention as being of special interest for Dursley, and perhaps to Local History and Places of Worship as a whole. Information last updated on 6 Feb 2019 at 11:03. This Report was created 17 Apr 2019 - 01:10:56 BST from information held in the Gloucestershire section of the Places of Worship Database. This was last updated on 7 Feb 2019 at 07:45.